'Pallaanguzhi', 'marapaachi', 'vettilai chellam', 'kolaambi', 'vaal uruli', 'kooja' ..... do these ring a bell? Or do they seem to be 'Malayalam and Sanskrit' to you? Have you seen a coffee grinder? No I don't mean the electric one - the mechanical one used to grind fresh coffee daily several decades ago? 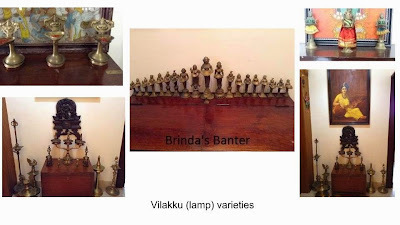 Well I got to see these and much more - all under one roof at my niece Shanthi's apartment in Thiruvanandhapuram. 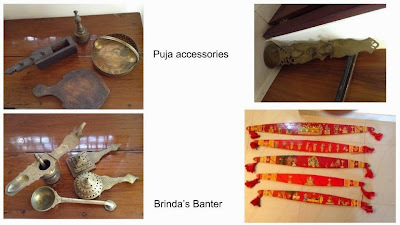 Join me in taking a nostalgic look at the typical items found in traditional South Indian homes more than 40 -50 years ago. Our ancestral homes used to be sprawling and spacious and also housed a large number of inmates - more mouths to feed, more hands to help, extra-large utensils to serve all purposes. Come weddings / functions / festivals / vacations, the houses would be ringing with extra activities and religious/festive fervor. With all of us moving out to settle down in the metros, gone are our houses and with them, all those brass / bronze / copper-ware and the miscellaneous stuff. They have become passing thoughts peeping in our minds once in a while. 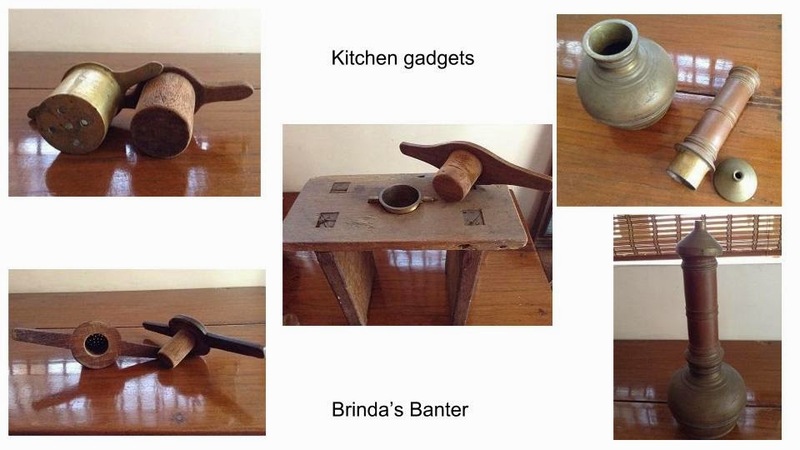 I have known Shanthi's penchant for old items used in old traditional households a couple of generations ago. 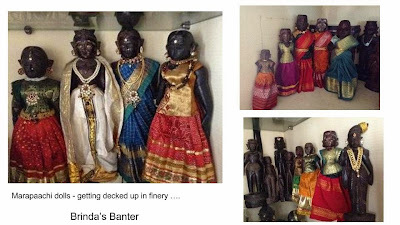 Whenever she visited relatives or friends in their ancestral homes, she managed to entice them to sell her such 'antiques'. Some were more than happy to get rid of the unused, idle, space-consuming items which I'm sure were elated to get elevated in status as they occupied pride of place as part of her valued treasure! I also know she is a big fan of Ganesha and Hanuman and a collector always on the look out for special / novel looking idols. I made no bones of the fact that I was curious to see her 'famed' collections in her 'home museum'! Shanthi's enthusiasm too soared - it is not always that you get a genuinely 'interested' visitor. She started bringing down the curios from places high and low or from giant boxes or cupboard shelves for me to take close-up shots. While my fingers went clickety click, I also mentally tried to register her running commentary about each. The collection was really impressive - to say the least. I can admire antiques but am not a collector myself. For one, they cost a fortune and again they need space and maintenance. I had believed they needed maintenance but what struck me as I admired the dull and jaded brass items there, was that they didn't need to be scrubbed and shiny - just leave them alone for that antique look! Cool! Hm.... where do I begin? 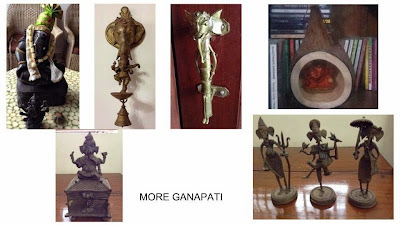 Okay, let's begin with 'Vignaharta' - Lord Ganesha seemed to be omnipresent in the apartment - sometimes as a Maharashtrian or a musician, sometimes with his famed pot-belly, sometimes with a structure as lean as a pole, and sometimes as a door handle! They are all yours for scrutiny! Another favorite God of hers is Hanuman. 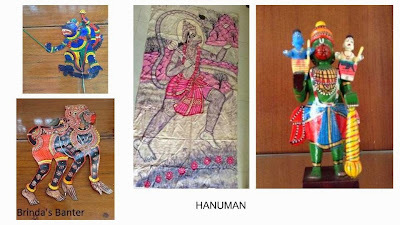 I am presenting only samples of rare Hanuman pictures. Two of them (on the left) are puppets, the big Hanuman painting on cloth has sentimental value for her. The last one I found to be very unique - Hanuman carrying Rama and Lakshmana! The array of 'vilakku' (lamps) is really tantalizing! A peep in the puja room unfolds some really ancient stuff - the wooden 'aamai palakai' (for gents) to sit on, the wooden box which would contain 'vibhuthi' (sacred ash), the brass basket for flowers and of course the bell to be rung during the daily puja (above left in the pic above). Then you have the accessories chiefly used in temples - the small lamp with a handle (with a depression in the center for storing oil along with a small spoon) - used to light an array of lamps and two different lamps with a number of wicks to be lit and used for 'deepaaraadhana' for each deity. 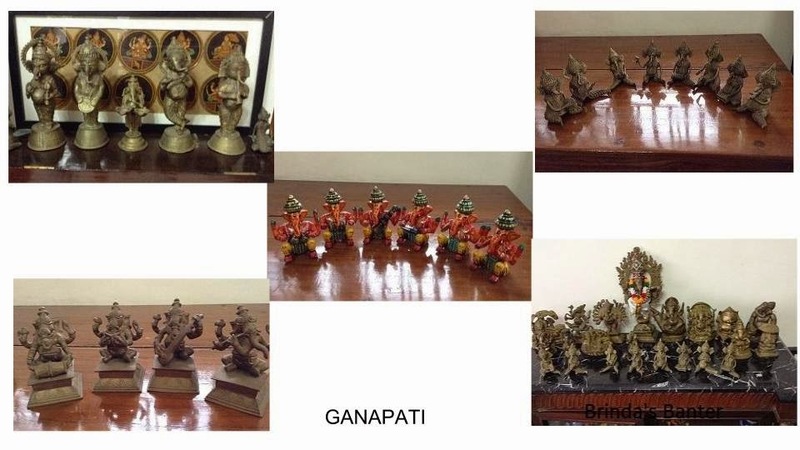 And of course the 'karpoora aarti' holder(below left in the pic). An interesting piece is the 3 1/2 feet-long special brass 'udharini' (spoon) with intricate carvings (above right). The colorful wooden pieces form the collection of 'Ona(m) villu' released every Onam (below right). They are made by a particular family - from 'Kadamba' wood and using only five natural colors. Collectors can buy one at a time every year, each symbolizing a particular aspect of prosperity. Another corner houses a collection of unique 'kunkuma choppu' in all sizes and shapes - wooden or brass, heavy or light! I don't remember anybody at home addicted to betel leaves. But it was exciting to see the 'vettilai chellam' set - the rectangular brass boxes with a partition - to hold betel leaves and betel nut; note - these had keys - so precious were the betel leaves to the addicts! The other accompaniments in the picture are the tiny circular box to contain 'chunambu' and a plate to prepare the 'paan'. And of course the tall 'kolambi' (spittoon). To cater to larger gatherings, the 'chunambu' would be kept in the tall large container (extreme right above). 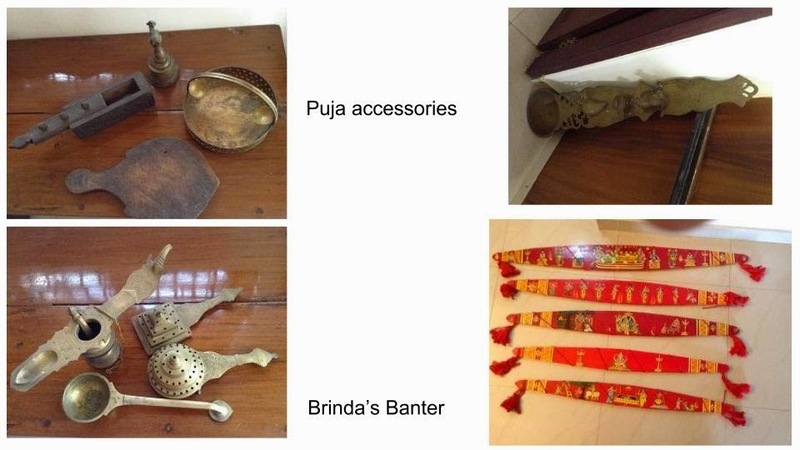 One item that is missing in the set is the betel nut cracker. 'Marapaachi' dolls - typical wooden dolls from Andhra Pradesh, originally made from red sandalwood were made from single wooden pieces. A 'marapaachi' couple were traditionally a part of the 'cosmetics set' gifted to the bride for 'velayaadal' at Iyer weddings - now they have become a rarity. Babies could be given 'marapaachis' to play with - they could chew on the wood which had medicinal values. It is also great fun dressing up the male, female and the kid 'marapaachis' in finery as per our artistic talents; they are also a part of 'Navaratri Golu'! Shanthi has a good collection of the traditional game of 'pallaanguzhi'. She told me that the game is known as 'malanga' in Indonesia. She had exquisitely shaped ones - the elephant 'pallaanguzhi' (bottom left) was bought from the US (made in Indonesia)! But she didn't have a brass one (we had such a 'pallaanguzhi' at home in times of yore). Several games can be played using 'manjaadi kuru' (red seeds) or cowries / shells. I remember using tamarind seeds to play. Old measures which existed before the Metric system was introduced - 'para', 'naazhi', 'aazhhakku', 'pakka' etc. are rare to find now (see pic above). I remember that my maternal grand parents used to have a sensitive balance along with small weights - 'panavada' / 'pavan' (predecessors of milligrams / grams) etc as they used to call the goldsmith home for making jewels for weddings or otherwise. Actually I forgot to tell Shanthi to look for this item! Two / three generations ago, there used to be joint families. Or at least functions and festivals galore with feasts at home. 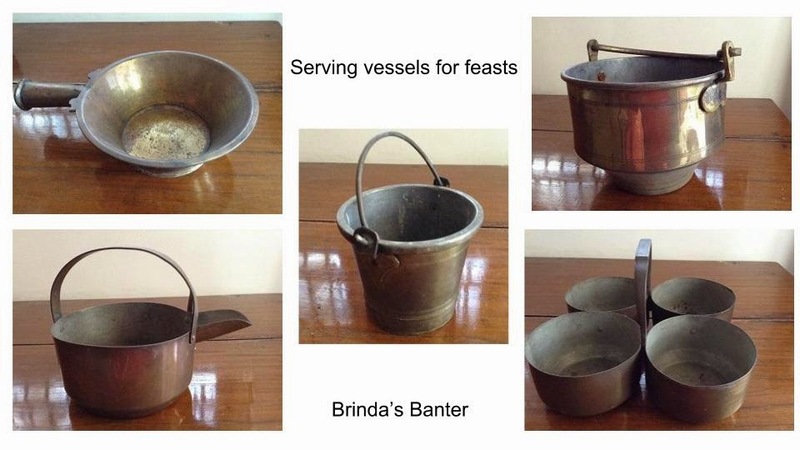 Huge brass vessels for cooking as well as serving would be found at home. Typical vessels were used to serve specific items - the sambar-serving bucket in the center and (beginning from top left, clockwise) rice server, pappadam container, 4-in-1 curry-holder and 'rasam-server' (with in-built strainer to retain coriander leaves / curry leaves thus preventing inconvenience to guests). 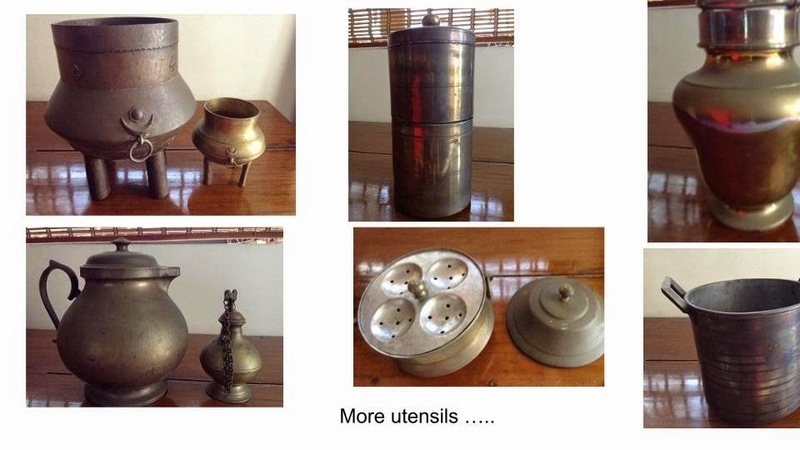 Then you have the giant coffee filter, idli-maker, big and small oil-holders (bottom left) and the 'kooja' (top right). Let me tell you something about the kooja which was a part of any travel in olden days - the bronze pear-shaped container with a lid screwed on to it, has a removable cup inside it. It served the purpose of carrying / procuring coffee from the station for the family during journeys. Later on the thermos flask replaced it. I remember the kooja playing a prominent role in the hilarious temple scene (where the boy-meets-girl) in the hit movie 'Shankarabharanam'. My husband has shared a funny incident about the kooja - as a boy, he was travelling with his father by train. His father had got coffee from a station but forgot to bring back the lid. The train had left by the time the lapse was detected. Nothing could be done to retrieve it. The problem was how to carry the kooja on disembarking - the handle is fixed to the screw-able lid, so with the lid, the handle was gone too. Father used a towel to make a bag - knotted it up with the kooja in it and asked the son to carry it. The lad let his eyes wander around the station, twirling the bag in his hand and ..... 'thud' fell the bronze kooja and .. broke. Father laughed it off saying it was good the kooja was gone too as it was useless without the lid! 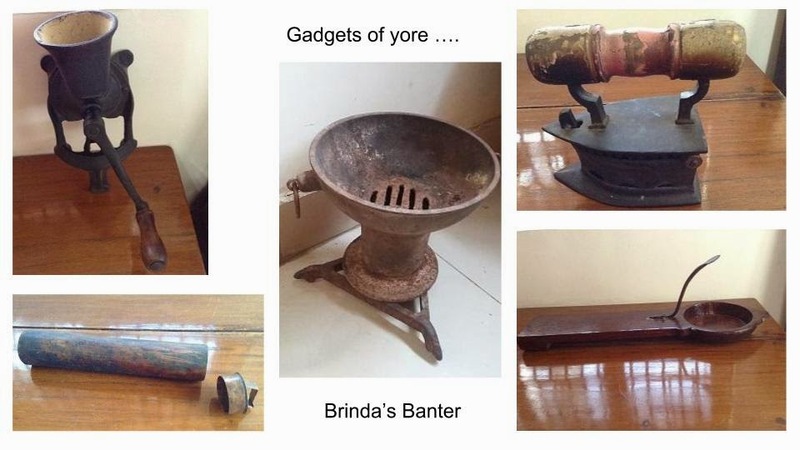 Now let's have a glimpse of some gadgets found in kitchens of yore - all of them are mechanical ones. There is the coal 'gummatti aduppu' ('angeetti') (center in the above pic). Then there is the coffee grinder fixed on a shelf - the kids used to take turns every day to grind fresh coffee powder for the day with the home-roasted coffee seeds. A handful of the seeds would be put in the cup on top and the handle would be rotated and the ground coffee powder collected in a bowl placed under it. 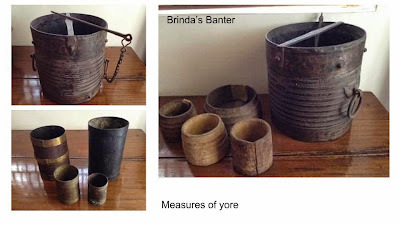 Unfortunately Shanthi has not managed to get the mechanical cylindrical coffee-seed roaster of yesteryears. 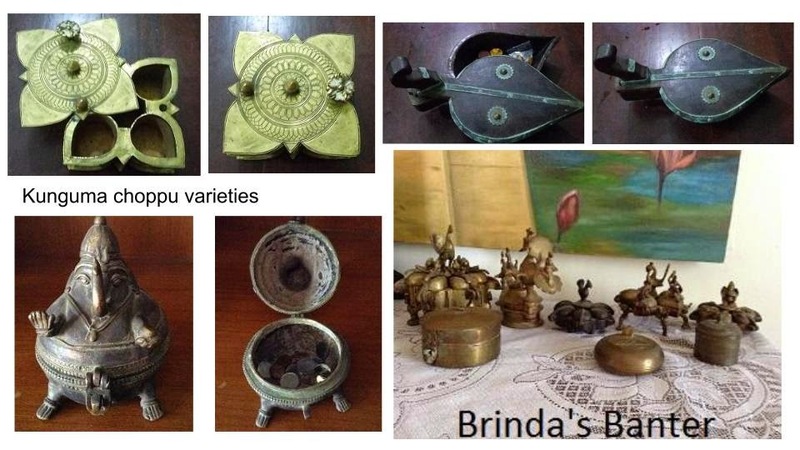 The pic on below right is of the metal 'kozhal' (cylinder) in which you insert the unpeeled Kerala plantain (nendrapazham), close it with the lid and shove it in the 'adupu' (stove which uses coal or wood) and take it out after a few minutes to find the plantain nicely cooked and ready to eat. Above right is the old coal-iron which some of you must have seen. Below left is the 'thenga cheravai' - coconut scraper. Most of us still have this gadget at home even today but this one is special - take a look - it has an extension at the bottom to serve as a plate! Cool, right? 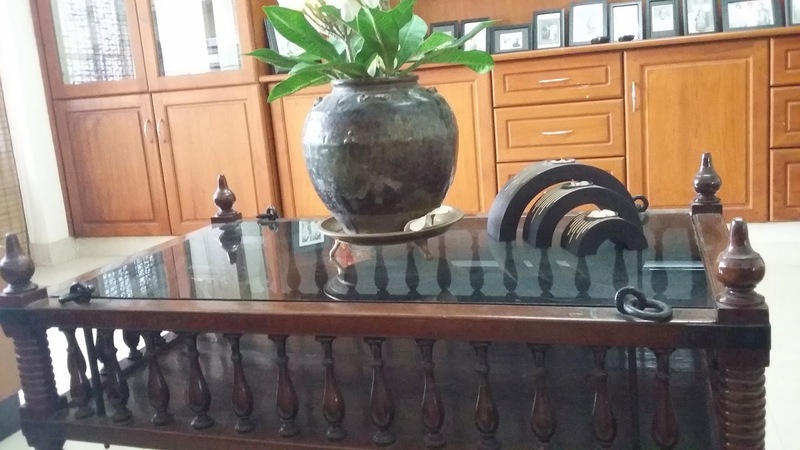 Shanthi has an ancient 'sevai naazhi' - a brass one mounted on a tiny wooden table with a wooden press (in the center in the pic). This would require tremendous pressure to squeeze out the 'sevai'. My parents had given me a metallic screwable 'sevai naazhi' but it has vanished from my house as I switched over to instant 'sevai' - don't ask how / where! 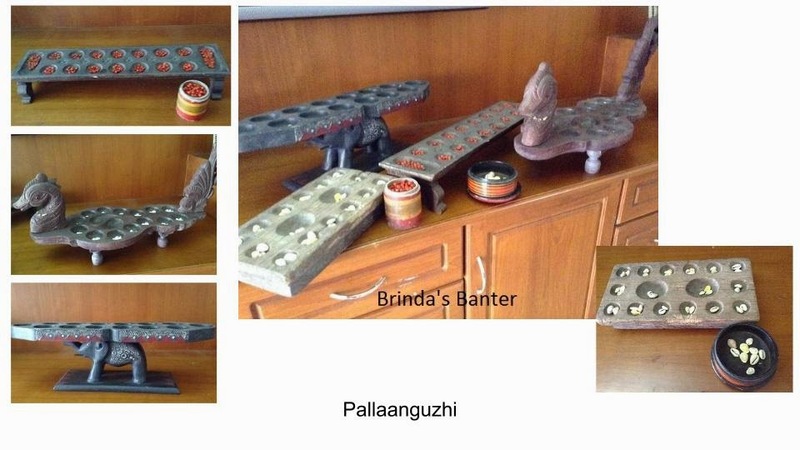 The gadgets on the left are 'thenguzhal naazhi and Srilankan 'idiappam-maker' - don't fail to notice that they do not have separate plate-moulds but built-in holed-plates! 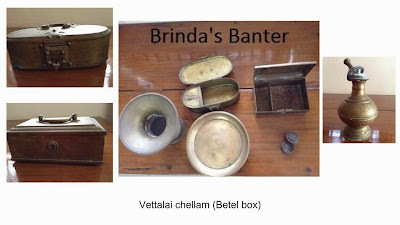 The gadget on the right is the brass 'puttu kutti' used to prepare 'puttu'. 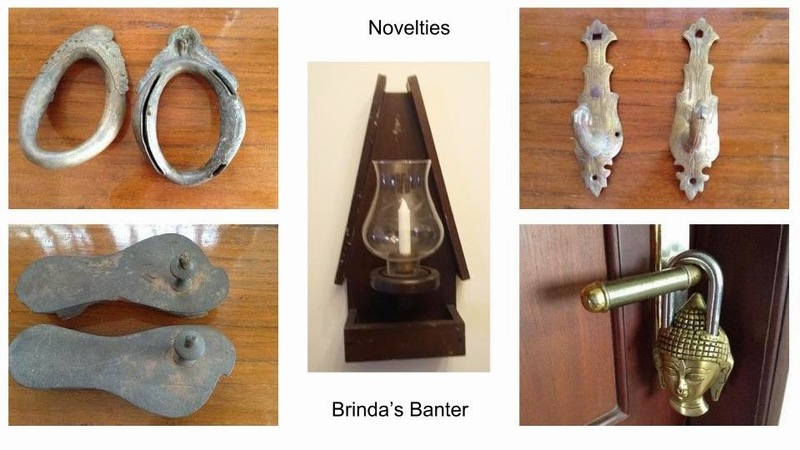 Then I found these novelties - the 'chilambu' (anklet), the 'midhiyadi' (ancient wooden slip-ons), the chimney lamp, peacock door handles and a 'Buddha' lock. There is the permanent 'nalungu' coconut ( a hollow brass spherical ball with a few pellets inside to go clickety click) - used for the several weddings in an ancestral house. Many of you must have seen the 'kindi' - at least in Malayalam movies - normally when anyone returns home after an outing, they pick up the 'kindi' filled water and wash their feet. I mistook this item to be a giant puja item for 'camphor arti'. But I was told that this is the item is the 'vaal uruli' to pick up 'payasam' for naivedyam at the temples. 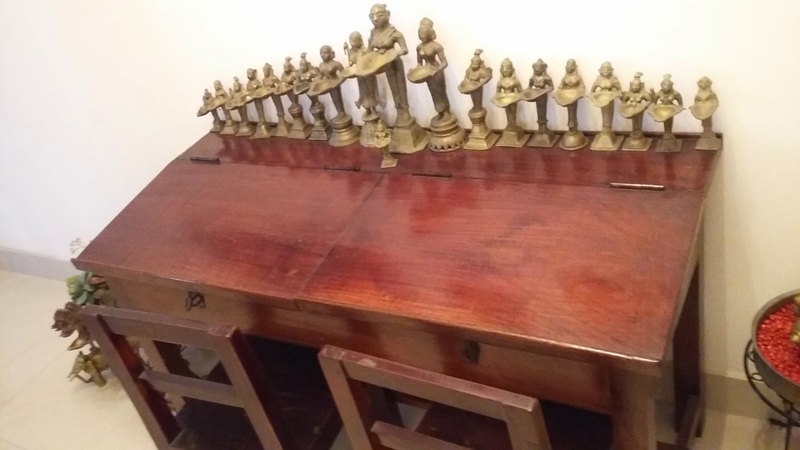 The best creation out of waste (read 'unused stuff') was the artistic center table adapted from the 'thottil' (cradle) which had been bought more than 50 years ago for Shanthi herself. She has also preserved and maintained the double desk and the two tiny chairs used by her husband and his elder brother. Of course Shanthi's daughters have long outgrown them, so perhaps these will have to wait for the next gen kids! These are not all - there are plenty more miscellaneous items. She is into numismatics too - her collection of coins are irresistibly tempting. And paintings too - not Raja Ravi Varma's but good replicas. I felt the satisfaction of having visited a mini museum, thanks to Shanthi. During this little verbal-visual tour, I do hope you too will enjoy the sight of some stuff you have never seen / only heard about before or revive nostalgic memories of your childhood experiences!